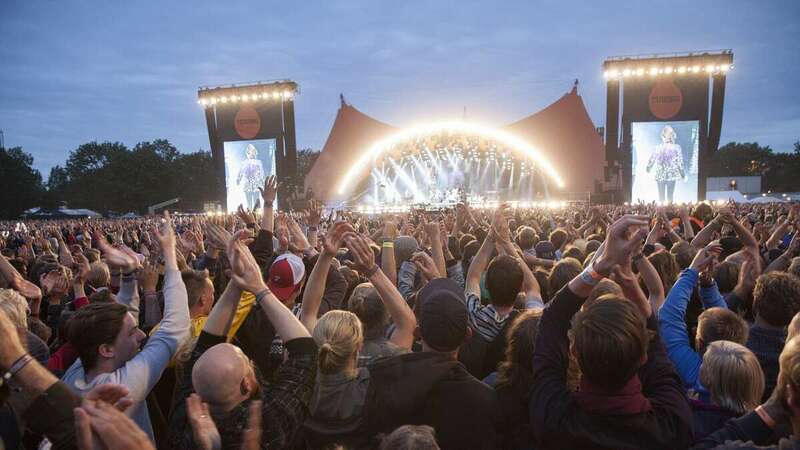 'We Start With 50,000 Liters Of Farm-Fresh Urine...' : The Record To fertilize its barley, a brewery in Denmark is using urine collected at the Roskilde Music Festival. The beer is called "Pisner," because of course it is. Fans at Denmark's 2014 Roskilde Music Festival wonder why no one is collecting their urine for use in beer production. If you've ever attended a gigantic music festival, you've seen them: row upon row of portable toilets collecting untold oceans of human waste. They help create a piquant bouquet that also includes steaming asphalt, deep-fried corn-dog batter, a slurry of mud and torn-up grass, and the sundry odors that can only emanate from a broad cross-section of humanity assembled in one place. What you probably haven't done — although who's to say, really? — is pondered the collection of 50,000 liters (minimum) of human urine and thought, "What a waste." If you have, here's a wee bit of good news. Over the weekend, news leaked out via Reuters that the Danish brewery Norrebro Bryghus has created a novelty beer called "Pisner," which the Reuters piece helpfully explains is "a word-play combining pilsner with local slang for urine." (Not gonna lie, never thought of that particular word as "local slang.") To make Pisner, Norrebro takes 50,000 liters of urine and... no, they don't put it in the beer. Gross! No, no, no. They use the urine, collected at Denmark's renowned Roskilde Music Festival, to fertilize their fields of barley, rather than relying on animal waste (though one could argue, given the crowds at some of these events, that this is exactly what they're relying on). And, just as you can't taste cow doots in your kale — or can you? — the urine doesn't actually make its way into the beer itself. According to Reuters, the whizzes at the country's Agriculture and Food Council call it "beercycling," because that's the world we live in now, and you know what? That's the world we deserve. So there you go: just a little something to ponder as you piddle away your morning.